NASA's brain surgery robot may give surgeon's better control during delicate brain operations. 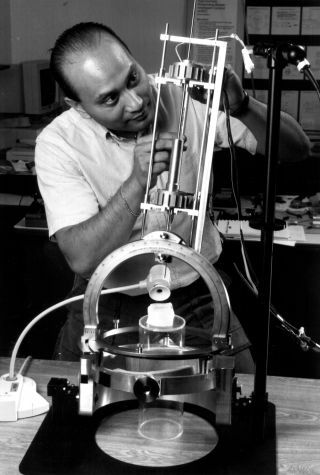 In this historical photo from the U.S. space agency, Mechanical Engineer Michael Guerrero works on the Robot Brain Surgeon testbed in the NeuroEngineering Group at the Ames Research Center, Moffett Field, California, on June 2, 1997. Principal investigator Dr. Robert W. Mah states that potentially the simple robot will be able to feel brain structures better than any human surgeon, making slow, very precise movements during an operation. The brain surgery robot that may give surgeons finer control of surgical instruments during delicate brain operations is still under development.